As a life long lover of Rossini and an annual visitor to the Rossini Opera Festival in Pesaro, I have been pleased at the growing interest in Rossini’s serious operas in the United States. Around the time of Rossini’s two-hundredth birthday in 1992 there were a flurry of productions of rare and almost unknown works in America (Ermione, Bianca e Falliero, La pietra del paragone and others), but for they most part they were isolated moments. The Metropolitan even got into the game in 1990 with an elaborate period Semiramide with some of the best Rossini singers of the day (Horne, Cuberli, Ramey, Merritt). But then the revivals of these wonderful works seemed to falter…until recently. Today’s truly first rate bel canto singers, perhaps the best since the early nineteenth century, have stimulated a revival that has seen productions of Maometto II, Armida in recent years, and most recently La donna del lago. In the last few years, La donna del lago has become almost a staple in European houses for the first time since 1850, but in this country it has been practically unknown–until Santa Fe Opera produced it in 2012 and the Metropolitan imported the production with Joyce DiDonato, Juan Diego Florez, and Daniela Barcellona for its 2014-15 season. The Met scheduled the opera for its HD series of live broadcasts in cinemas around the world, and Linda Bjelland, frequent Pesaro visitor and inveterate Florez fan (she belongs to the Florezidos–Juan Diego’s fan club, and travels the world following his performances), proposed that she and I offer a short course to introduce opera lovers to this work, culminating in the theater broadcast of March 14. Although Linda lives near Denver and I live 65 miles north of there in Colorado, we met in at the Rossini Festival in Pesaro. She proposed that we offer the course through the Academy for Life Long Learning, a school aimed at retirees, which offers courses in the Denver area. I have to say that I was skeptical that we would enroll enough “students” to make the course preparations (not to mention the hour’s drive for me) worthwhile, so I was pleasantly surprised when we signed up 26 enthusiastic opera lovers. Linda and I split the time in the course, which totaled six hours over three sessions. In our first session, we placed Rossini in the context of his times and opera history and discussed his biography. In the second class we concentrated on Walter Scott’s Lady of the Lake and Rossini’s Naples operas. 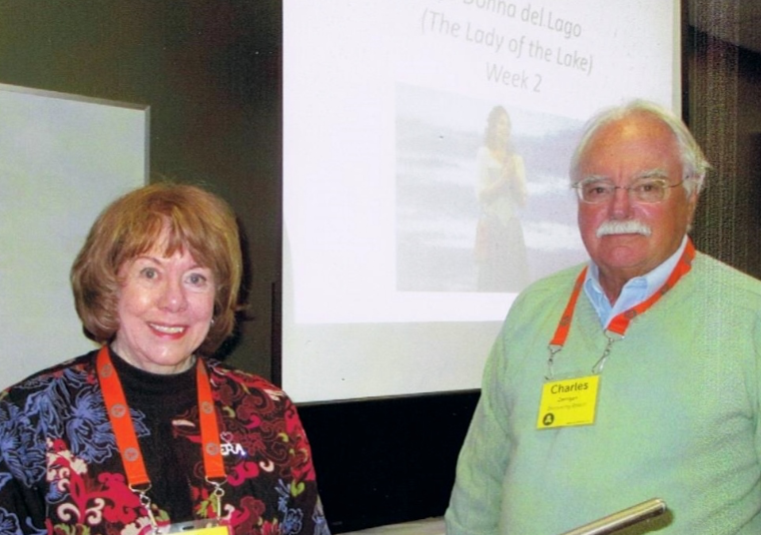 The third class was a detailed analysis of La donna del lago, illustrated by video clips. We also compared various productions we have seen recently (Paris, London, Milan, Santa Fe and Pesaro’s concert version). Of course there were pictures from Pesaro at Festival time, and for the finale we both wore ROF tee shirts we picked up at last summer’s festival. Our students were very positive about the class, and I think we made several converts to the infinite pleasures of Rossini. The Met’s ex-Santa Fe production was not one of their best efforts, but it was actually set in Scotland and Rossini and Scott did not appear as characters on stage (as had been the case in London). One must be thankful for small things. Needless to say, the singing was absolutely wonderful, and audiences the world over were able to experience thrills akin to what nineteenth century audiences knew. Elena, “Uberto” and Malcom introduced thousands in all corners of the world to a spectacular Rossini opera, and perhaps our class helped a small group in our corner of the world appreciate Rossini even more.